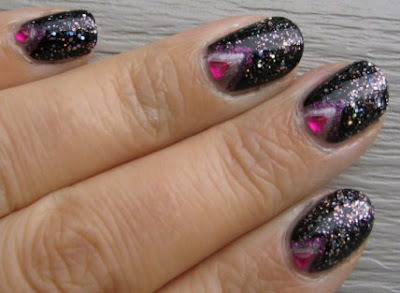 I have been falling in cosmic love with all the dark polishes layered with sparkle I've been seeing. Especially those with holo-glitter. I'm lusting after polishes like NfuOh GS-14. Here's what I did last night. Please forgive me once again for the blurry photos! My camera and I are on the rocks again. I painted my nails with Wet n' Wild Black Creme, then painted on triangles of Sally Hansen Chrome in Sizzlin' Roze at my cuticles. I outline the triangles with my Art Deco sparkly fuchsia striper. 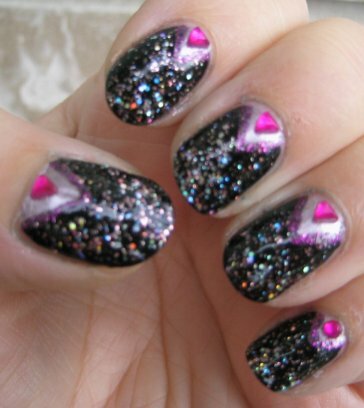 Added a few fuchsia triangle rhinestones at the cuticle for added glam. And went in for the kill with my Sally Hansen X-Treme Wear Strobe Light. These are an attempt at Tim Burton's Alice in Wonderland nails. Each nail has a bit from the backgrounds of the posters. Red hearts for the Queen, green top hats for the Mad Hatter, and blue keyholes for Alice. HOWEVER. After all that work brushing on the craft paints (especially when it came to painting my right hand) I went ahead and ruined it with a sparkle topcoat! Without taking a few pics first! AGH! I have learned my lesson! I used 2 coats of Wet n' Wild French White Creme for the base colour, then played with the craft paint. These didn't sty on last night. I took a few quick pictures under the yellow light and then cried "Off with their heads!" such a great idea for the Alice in Wonderland mani, I loved the posters they had to promote the movie :) ... and tim Burton in friggin awesome!! Oh you are SO not alone on that count. :) Superdork right here. Fangirl. Yup. Oh, AWESOME! 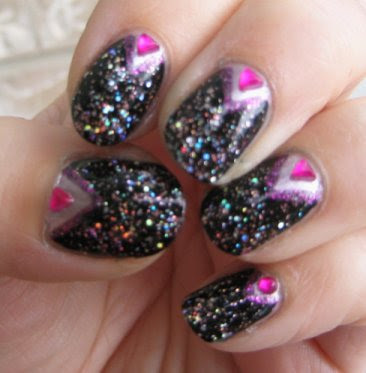 Too bad the sparkle ruined it, I freaking love the idea of the AIW mani! I know there were a lot of folks who didn't love that movie, but I wasn't one of them - I adored it SO much. The first one is totally awesome, and really captures the idea you had! 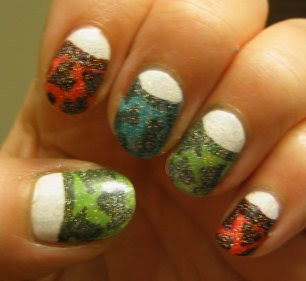 Excellent top mani. This fall's theme seems to be space related and this is an excellent addition. Cheers! 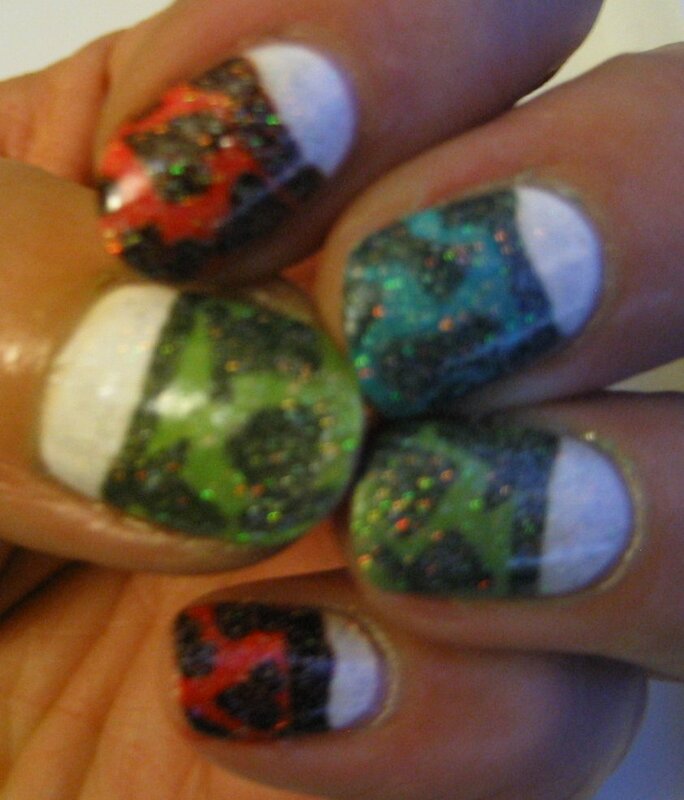 :) I did see a couple spaced out manis recently come to think of it! If anyone has links to space related manis please consider posting them so I can check it out! Awesome mani's, too bad about the AIW mani :( , they looked really good. i loooved the movie. Thanks alikat. 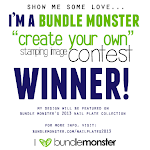 :) I think I'll give that design another try soon. I feel as though that spacegirl mani should have a Bowie title. Like Moonage Daydream or something. Ya know? A list of mani-ideas named for Bowie songs is an excellent idea.